Next up in the retro WrestleMania review series, we got WrestleMania 30 from The Big Easy. Let’s get it started! Can you believe that Daniel Bryan was originally slated to face Sheamus at WrestleMania? If that happened, that would have been the third time in a four year stretch that he faced him at WrestleMania. Thank goodness WWE came to their senses. It sort of made sense in a way that this is what would start the show first because the ended up finishing the main event with all of them involved. I loved this match because Triple H was forced to wrestle a different style than he is accustomed to. The funny thing is we have rarely seen Triple H face off against guys who wrestle a similar style to Daniel Bryan, much less people Bryan’s size. We saw Triple H working over Bryan’s arm, applying crossfaces, variations of German suplexes and more. It was pretty rad to see him seamlessly adapt to Bryan’s style. The crowd was hot throughout, primarily because of Daniel Bryan, but Triple H was more than game and he made Bryan look like a million bucks. The post-match attack was pretty predictable in hindsight because they were going to make sure that if Bryan was going to leave the night as WWE Champion, he will have to overcome every surmountable odd that there was, and this was merely the tip of the iceberg. I think it would have been more effective if they were to have the main event immediately right after this match to make it even tougher on him, but I agreed with the pacing of the match. A total squash, but it was what it needed to be. Three old timers have no business remaining competitive with three young hounds of justice who would eventually go on to each become a Grand Slam Champion. 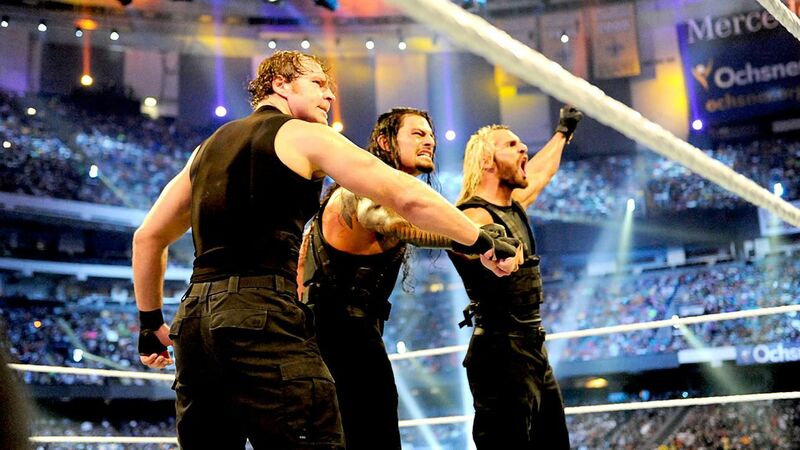 They got straight to the point, and The Shield destroyed their opponents as they rightfully should have. Match obviously doesn’t get a rating, but no complaints from me. I think we are all in agreement that John Cena had no business going over Bray Wyatt here, especially considering the stellar performances Wyatt has had against Daniel Bryan and The Shield on PPV up to this point. Overall, this match was fine, but not only did it go on too long for the point it was trying to make, it was very bland for a big portion of it. They were basically trying to tell the story of Wyatt questioning Cena’s morals and whether or not he should turn to the dark side by resorting to weapon use in order to win. Instead Cena just ended up taking out the entire Wyatt Family anyways. He wisely recognized that he couldn’t get disqualified for using weapons against people not in the match, so he did just that. You’d think Bray would have been wiser. A match that still gets people heated up till this day, Lesnar ending the streak. When I was watching this live, I was of course in shock, but I wasn’t furious as other people probably were. I kept hearing about how the streak should be reserved for a guy like Roman Reigns, Ryback or Cesaro to beat. While I questioned the decision, I wasn’t angry at it. I mean, should Undertaker be going over Lesnar in any capacity in 2014? Sure, I could understand if this was back in 2002, but the bottom line is that if you want Lesnar to be booked as an unstoppable beast that you want to hate, something like this was bound to happen. And there was no way the streak would have ended without Undertaker’s approval. So if it was fine with him, it should be fine with everyone else. Understand that this is all…well, fake after all. Anyways, this match was pretty damn bad if I do say so myself. I loved Undertaker vs. CM Punk in the WrestleMania before, because it was the last time Undertaker had a vintage performance at WrestleMania. Here, he looked old, out of shape, tired and looked like he had no business in a WWE ring, much less wrestling Brock Lesnar for nearly half an hour. I can’t imagine how long he must have been on an oxygen mask afterward. Taker had a series of solid matches with Lesnar in 2015, but here, this was just cringe-worthy at the time. It just looked like every move that Undertaker did hurt him, and the moves that he used to hit with ease took an incredible effort on his part. A part of me actually wanted this to be his last match at WrestleMania. I didn’t want him to keep hurting himself and putting himself through pain just to show us that he could still go. His legacy was intact well before this match.